“Contemporary artworks by a sculptor, a woodcarver and a film maker are set to bring the stories of an intriguing historic house in Norfolk to life with a new exhibition opening at the National Trust’s Felbrigg Hall. Felbrigg Hall, home of Robert Wyndham Ketton-Cremer, who devoted his life to preserving Felbrigg, has had a colourful past. As part of the National Trust’s Trust New Art Programme, and in partnership with the Norfolk Contemporary Art Society (NCAS), 250 artists applied for the opportunity to undertake a residency that would give them special behind the scenes access to the house and its archives to create new perspectives on its history through contemporary art. Florence Kennard, Alec Stevens and Alida Sayer were the artists chosen for their creative ideas and experience. After months of immersing themselves in the stories of Felbrigg, their work will go on show from April 22 in an exhibition called ‘The Makers’. Florence Kennard is a film maker who became intrigued by the passing of time and with the rhythms of the house. With access to the difficult-to-reach clock tower as well as other clocks in the house, Florence focussed on their workings, sounds and mechanisms. She was also inspired by the process of preparing the house each winter for its spring opening and has entitled her film, Rebirth. “‘The Makers’ follows on from ‘The Tourists’, a successful project initiated by Norfolk Contemporary Art Society and the National Trust at Felbrigg in 2014. So we were keen to build on this project, but to include an artists’ residency element so that the artists could spend time at Felbrigg, immersing themselves in the atmosphere and history of the estate. ‘The Makers’ Exhibition at Felbrigg Hall will run from 22 April to 29 October 2017. 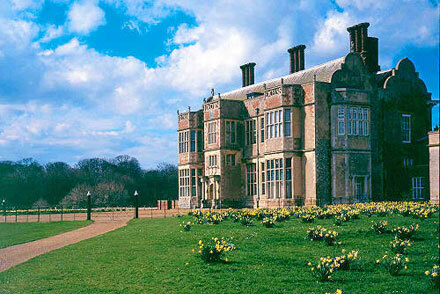 For further information and opening times visit www.nationaltrust.org.uk/felbrigg.